The cables are desgined for structure wiring, compatible with all known connection systems according to EN 50173. Based on the design for structured wiring (found in IEC 61156 and BS EN 50288), this cable brings together high frequency data transmission and circuit integrity in four pair cable that will continue to transmit data even when being directly attacked by fire. Note: Asterisk * denotes superseded standard. Conductors: Plain annealed copper wire, solid according to IEC(EN) 60228 class 1. 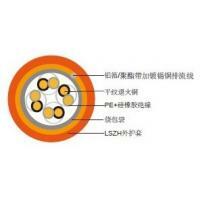 Insulation: PE wrapped with fire resistant silicone rubber compound type EI2 as per BS 7655-1.1.
crosstalk. Two-pair cable had four cores laid in quad formation. Cabling: Pairs are cabled together in concentric layers.